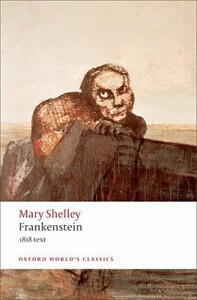 Victor Frankenstein creates a monster, brings it to life and immediatly abhors it. He leaves his appartment and when he comes back the monster is gone. Meanwhile, the monster learns how to live, to speak, to read and to write by watching a family. He slowly loses faith in humanity because everyone he ancounters is afraid of him and/or wants to kill him. He is lonly, wants a companion. He tracks down Frankenstein and demands a female monster. Frankenstein agrees to this because his family is threatened (the monster already killed his little brother) but then destroys the second monster before it is finished. Needles to say that the monster was not amused. Frankenstein is beautifully written. Mary Shelly really has a way with words. I liked this version of the book because it suprised me. I always thought that Frankenstein was old (he is in his early 20s) and that the monster was not able to speak but in fact he can speak quite well. Also, he is not green but yellow-ish and he is not afraid of fire, there were no angry villagers with flaming torches after him. Maybe that is in the second version which I will definitly read too. And I can really recommend this one. It's awesome!